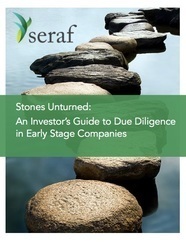 This 100-page eBook will guide you step by step through the due diligence process. You'll also find a chapter on mistakes and lessons learned, along with templates to use in your own diligence efforts. Interested in purchasing a hard copy version of Stones Unturned? Buy it now at Amazon.com.